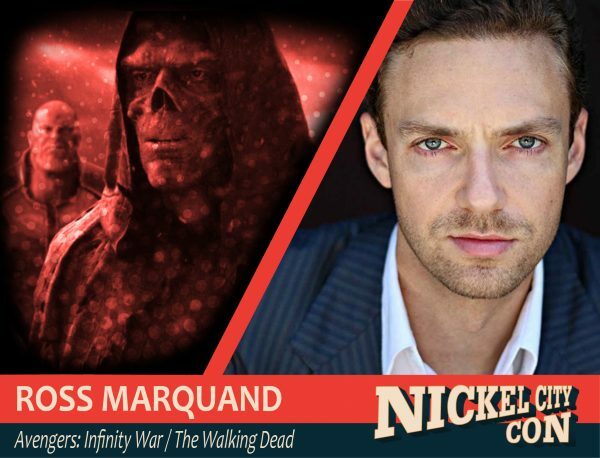 Ross Marquand is an American actor native to Denver. Upon receiving his BFA in Theatre from the University of Colorado he moved to Los Angeles and quickly garnered attention in various film and television projects. After portraying the late Paul Newman on “Mad Men,” Marquand went on to land perhaps his best known role, Aaron, on “The Walking Dead.” Following this came notable credits on “The Mindy Project,” “The Last Tycoon,” and “Brockmire,” as well as a cameo in “The Avengers: Infinity War” as the perennial super villain Red Skull. Also an accomplished voice actor, Ross has lent his unique vocal talents to projects like “Robot Chicken,” “Family Guy,” and “American Dad.” He is known for impersonating a plethora of celebrities including Harrison Ford, Brad Pitt, Matthew McConaughey and over 50 others. It was this skill set that helped the actor land his most recent role on “The Avengers: Infinity War” as the perennial super villain Red Skull.